Living Treasures is enthusiastically received by book clubs. Read about a recent book club visit here. The reading guide offers discussion questions, a Q&A, and more. Open the pdf file, right click and choose "Save As." Enjoy! 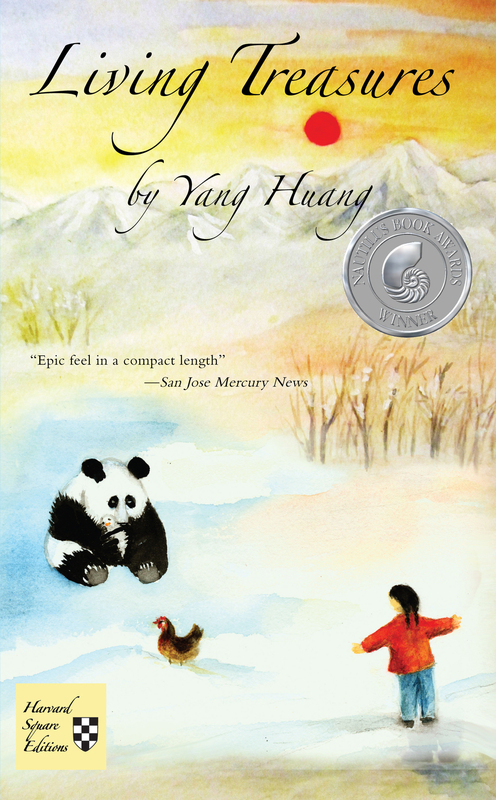 A starving panda eats a hen in order to nurse her cub in the dead of winter—there begins the perilous adventure of Gu Bao, a girl who grows up under the Chinese government’s one-child policy. Bao falls in love with a handsome soldier during the tumultuous Tiananmen Square protests in 1989. The demonstrations transfix her fellow students and kill one of her friends. Bao finds herself pregnant and faces the end of her academic career. Her grieving parents arrange for a secret abortion and ship her off to her grandparents’ house in the remote countryside where she was raised. Bao searches for her inner strength while exploring the evocative Sichuan mountain landscape. She befriends a panda mother caught in a poacher's snare, and an expectant young mother hiding from villainous one-child policy enforcers bent on giving compulsory abortions. All struggle against society to preserve the treasure of their little ones. Can Bao save a rural family from destruction, and help a giant panda along the way? She devises a daring plan that changes the lives of everyone around her. A deeply moving story of family, passion, and courage, Living Treasures is both a gripping page-turner and an incisive social critique, portraying a young woman’s quest for romance and justice in a rigid society. Bao, a law student, aspires to have both a career and family, but which comes first? A baby rarely arrives at a convenient time. The decision about the woman’s body is not an easy choice but rather a compromise that comes with a dear price. Bao’s struggle encapsulates many women’s journeys through life, as they experience the triumphs, suffer the heartbreaks, and learn to live with the consequences. "Huang’s measured yet evocative novel heightens Bao’s journey from timid student to defiant adversary in the midst of personal and political upheaval." YA/Mature Readers: Older teens and new adults will likely identify with Bao’s coming-of-age, despite its unique circumstances. “Huang does an admirable job balancing Bao’s individual story against the canvas of China’s evolution using crisply drawn characters who reveal their layers as the story progresses. "The personal and the political merge in Yang Huang's debut novel about a college student in post-Cultural Revolution China. Gu Bao negotiates the shifting landscape of a country still struggling toward modernity, as China's education system, family planning policies and the deaths of her fellow students in Tiananmen Square sometimes push her to desperate measures. The story moves from city life to the rural home of Bao's grandparents, acquiring an epic feel in a compact length." "Huang’s winning novel is more than another work of historical fiction. Living Treasures is endearing, extraordinarily moving, and its timely message about life makes it a must read for young and old readers alike." "Living Treasures is a book that breaks your heart, and then mends it with hope. Best book I've read this year." "The novel is itself a treasure. . . . All of the characters are rich and complex. Huang writes in such a way that the reader sympathizes with each one. This isn't easy to do, but she's done it well. . . . The theme is love and it circles round and back to it again and again. Bravo! I recommend this to others." "Living Treasures explores love against a backdrop of oppression in 1989 China. . . . Yang rightly keeps the plot focused on the human side of the nation-changing events taking place in the background of life-changing situations faced by the characters. . . . With the national, political, and cultural setting involved here, this would be a thought-provoking read for high school students, particularly if they are guided by a knowledgeable teacher." "Living Treasure is real, stunning, heartbreaking and intense. . . . If you read one book this year, consider this one—it’s full of real, achievable, human magic—you might even learn something too." "The novel offers an incisive fictional account of the perils of Chinese motherhood in all of its contemporary manifestations." "It is the story of a woman finding her footing within a changing socialist country and the universal story of women choosing their path, love, and control of life and body. I admire that you chose to write in English and did a beautiful job of writing a poignant, touching story that brings more understanding of the lives of China's people." "Living Treasures is a gripping and extraordinary historical and cultural novel that declares author Yang Huang as a talented, master storyteller." “This is a very well written and very touching story, about a young lady named Gu Bao who is studying to be a lawyer so she can protect people against government abuse in China. . . . Her struggle dealing with her parents over an abortion, her move to live with her grandparents for a while, and the development of a friendship with an expectant mother who is hiding in the mountains from one-child policy enforcers to safely deliver her baby, all these situations are richly described, exploiting all the psychological angles, showing the struggle in Bao's young mind to do the right thing.